As the mighty River Shannon tumbles down from Lough Derg, the last and largest of its lakes, to its deep estuary on the Atlantic coast, it provides a natural border for the three countries that surround its lower reaches – Limerick, Tipperary and Clare. The lowland parts of Limerick and Tipperary are limestone meadows, well watered by the Shannon and its tributaries and by the River Suir to the East. Here is the so-called Golden Vale, famous for its rich grasslands, where cattle, sheep and racehorses are raised. Beyond them, hedged pasture nudges the perimeters of the higher ground, such as the Galty Mountains in Southern Tipperary and the Slieve Aughty Mountains on the borders of Clare and Galway to the North. The uplands quickly revert to open, empty landscapes, where peregrines wheel over heather and gorse moors, concealed lakes and neatly squared-off plantations of deep-green conifers. A rude shock to this pleasantly modulated landscape comes with the Burren, in Northern Clare, a fascinating, and awesome stretch of land, exposed by some quirk of geology. Huge pavements of grey limestone dotted with massive boulders stretch as far as the eye can see. Clinging to the soil that has collected in the fissures of the rock are spongy tufts of grass an saxifrage, and a surprisingly unusual range of wild flowers – fragile cranesbill geraniums, rock roses, Mediterranean orchids, Artic-alpine gentians and mountain avens. The Aillwee Caves reveal the underground aspect of this landscape. 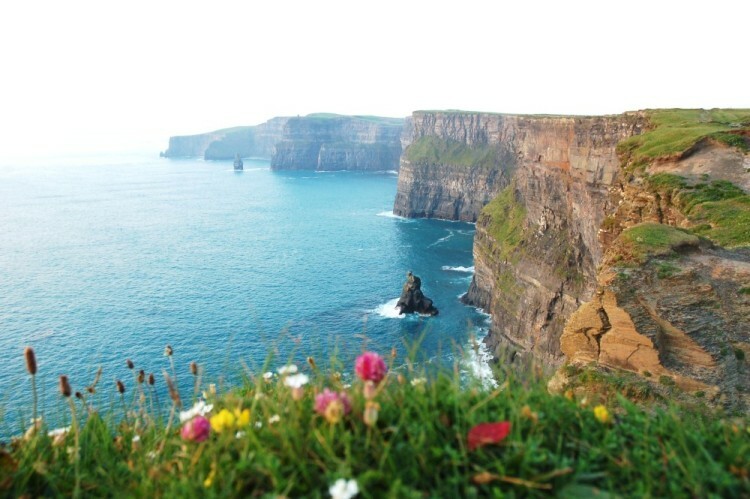 Just to the South of the Burren is another of Ireland’s great geological wonders – the towering Cliffs of Moher, which surge almost vertically from the sea to a height of 650ft along 5 miles of coastline. Paths lead across the grassy summits of the cliffs, with views of the Aran Islands and across Galway Bay to the mountains of Connemara. Puffins, guillemots and razorbills, along with ravens and choughs, dive and soar in dizzying aerobatic displays up and down the face of the cliffs. The Clare coast also has some softer faces, such as the fine beaches at Lehinch and Milltown Malbay, a Victorian resort which offers sea angling, golf, surfing and boardsailing. The spa town of Lisdoonvarna plays host to a curious and ever-popular festival each September – the International Matchmaking Festival, where the young and not-so-young go in search of a partner in marriage. Counties Clare, Limerick and Tipperary are all part of the province of Munster. In the past, its centre of power was in Tipperary, at the Rock of Cashel, now a majestic cluster of buildings on the crest of an ancient mound, with a ruined cathedral, soaring Round Tower and the exquisite Romanesque Cormac’s Chapel. But even before Celtic chieftains made these lands their home, the area around the lower Shannon appears to have been well populated, for it has numerous prehistoric monuments. Among them, the most notable are the rich cluster of sites around Lough Gur in County Limerick, and the spectacular Poulnabrone Dolmen on the Burren. The Celts left behind them the legends of their great pre-Christian heroes. The grotesque hag Mal is said to have attempted to follow the Ulster hero Cuchulainn in making a giant leap at Loop (or Leap) Head, only to fall into the sea. Her body was washed up at Mal Bay. Early Christianity saw the foundation of several abbeys, which grew and developed in medieval times under the protection of the Irish chieftains. But this region is perhaps better known for the monasteries built in the 12th century by the austere and reforming Cistercians, such as Monasterananagh in County Limerick, and Kilcooly and Holycross in Tipperary. Then the Vikings came, raiding the monasteries and villages all the way up the Shannon. They settled in Limerick – now the largest town on the West coast and traditionally a prosperous trading port – in the early 10th century. This was only the beginning of troubles suffered by the region – and Limerick in particular – at the hands of people from overseas. In 1651, Limerick was besieged for 12 months by Cromwellian troops before finally succumbing, and then faced two further sieges in 1690 and 1691. In this final siege, Patrick Sarsfield heroically ambushed the siege train at Ballyneety. But his efforts were in vain, and the 8th and 19th century elegance of Limerick today reflects the confidence and success of the wealthy English merchants and landowners who became its masters. Today, however, Limerick is remembered for a frivolous reason. It is said that a group of Irish poets, who used to meet in the village of Croom in the 18th century, added to their repertoire of verse a humorous, five-line ditty. This style of verse was avidly adopted by English versifiers, and the ‘limerick’ became popular across the world. The West Coast of Ireland is a spectacular area and is a must see on your tours of Ireland.